Happy March! I attended my first WordPress blog meet up in Galway over the weekend and I loved it! Below is part one, you can find part two on The Shortcode Facebookpage. One of the topics we talked about were apps they frequently use and also suggested plug-ins to use on a blog, how to choose them and what to be mindful of. The hosters touched on the Pocket app, and how it allows to save any article/Video/Image, so you can read it later or share it with someone else. This made me think, as I share a lot of links on my Facebook page, but they don’t make it to my blog. I then Googled to find out if there was a plug in that would help me to embed my saved Pocket links, and found a plug in that does exactly what I wanted it to. I downloaded, activated, authenticated the WP Stacker Plugin and tada, here are the links. 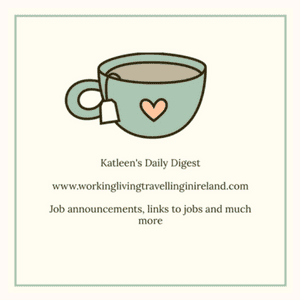 Most of them are around job announcements, but also some other links related to interview preparation, CV preparation, and some links related to Galway specifically as that’s where I am. Let me know what you think! Jobs, jobs, lot’s of jobs up for grabs in Ireland!